And the rewards are in: copious quantity of Swiss Chard in our garden. Having learned my lesson, I started harvesting early by removing the outer leaves and using them in a variety of culinary configurations: salads, steamed, sautéed, quiche, soups. Still, these five plants seem intent on matching my enthusiasm with continued growth and keep producing more leaves than I can use. Last week, I decided to invent a new use for them that would make them sandwich bloggable. 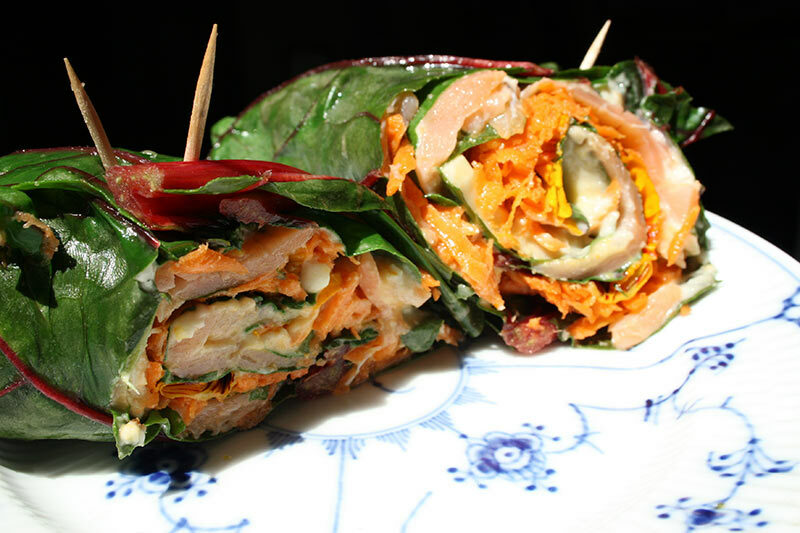 And so, for the first time anywhere (on this blog)….Swiss Chard Smoked Salmon roll-up. This required large leaves of Swiss chard and posed a challenge new to our budding sandwich blog: how to ensure the leaves don’t fall apart in the rolling process. You see.. although baby Swiss chard leaves are quite supple (not unlike baby lettuce), the larger leaves tend to be a bit brittle and I feared, would not survive the rolling process. So I had my Eureka! moment: blanch them. Blanching is just a fancy term for partially cooking veggies in hot water. I just put some water to boil in large sauté pan, dunked the leaves in for about 30 seconds, removed and dried them with a paper towel and Voila we were ready for a sandwich adventure. After blanching the swiss chard you want to start getting all the fillings ready. For that, grate the carrots and toss with the balsalmic vinegar. Truly, you can leave the vinegar out but Anders is a lover of mulitple layers of flavor, hence it’s addition. You may also just add the juice of some lemon.. anything to as Emeril says “take it up a notch”. Now comes the fun part. If you haven’t over-blanched the swiss chard, you should be able to do this without too much trouble. Starting from the narrowest portion of the swiss chard, begin rolling tightly until the rollup is complete. Secure with toothpicks. Slice and enjoy. This rollup must be eaten immediately or else all those fresh ingredients will just expire on you. Surprisingly this is quite filling. I made this about 3:00 pm on Saturday after a long shopping day and intended this to serve only as a small meal to tide us over until dinner. However, after having this with a glass of wine, we were good for the rest of the day. No dinner needed!